Lily is a new Flower Fairy who has just arrived in Fairyopolis when she uncovers a message guiding her to a magical secret place. Explore the exciting novelties on each spread as she makes her way through the treetops, over a glimmering stream and through a field of poppies. 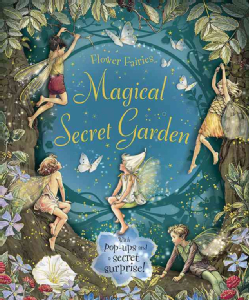 The incredible pop-up on the final spread features a walled garden, where you will find waterfalls, butterflies and lots of fairies!